When photographer Jeffrey Aaronson received a call from Newsweek in 1984 to photograph Steve Jobs, he had no idea who Steve Jobs was or what impact Jobs was about to have on his life or the world. The personal computer had yet to be “officially” born. Steve & i: One Photographer’s Improbable Journey with Steve Jobs tells the captivating story of a young photographer and a young entrepreneur, and the friendship they forge when they are both twenty-nine years old—just as Aaronson is beginning to offer the world a new view through his lens and Jobs is beginning his mission to change it by introducing the most user-friendly computer ever conceived. 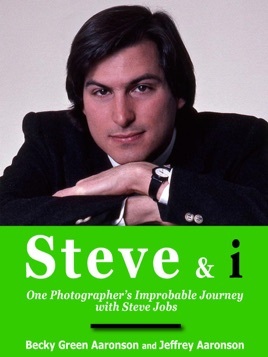 This 38-page powerhouse of a book is packed with personal anecdotes and rarely seen photographs, which not only chronicle the launch of the first Macintosh personal computer, but also capture the essence of Steve Jobs the man before he became the icon. It’s a must read for those who want to experience and be inspired by a side of Steve Jobs that few people have glimpsed. A portion of the proceeds from this book will be donated to several leading cancer research institutes in hopes of helping find a cure for the disease that took Steve Jobs’ life far too soon. "A critical moment of shared inspiration is captured in this short but sweet profile of an intimate friendship between two highly motivated young men, forged immediately in trust and professional integrity. A rare, honest glimpse into the ensuing creative sparks that fly in the early blossoming careers and bonding of two visionaries who decide to be inspired by others AND courageously follow their callings and dreams. Bravo!" "This is a sweet little book about a hugely talented and creative photographer's relationship with a hugely talented and creative entrepreneur. With warmth, insight, and keen appreciation, Jeffrey brings back to life a man who for all his reputed prickliness and short temper was capable of simple, deep friendship." "Photographers and Apple fans alike won’t want to miss this moving portrait of a private but profoundly influential man." Jeffrey Aaronson is an internationally recognized photographer who has flown over a million miles crisscrossing the globe in pursuit of photographic stories. For more than two decades Aaronson worked on assignment for many of America’s top publications--everyone from Time, Newsweek and National Geographic Society to Vanity Fair, Rolling Stone and The New York Times Magazine. During that time he ventured to nearly every corner of the world. From the shores of the Pacific to the high peaks of the Himalayas to the heart of the Sahara Desert--he pursued Komodo Dragons in Indonesia, boated down the Yangtze River in China, side-stepped the Khmer Rouge in Cambodia, and ventured into some of the most remote regions of the world. He also photographed everything from China’s Democracy Movement in Tiananmen Square to Nelson Mandela’s inauguration in South Africa to life behind North Korea’s Iron Curtain.